Large snake-like eyespots on the body might give a hungry bird second thoughts about attacking this caterpillar. Tiny bite marks and a folded leaf are clues that a caterpillar hides inside. Two years ago I rescued a small spicebush from a construction site and planted it in my back yard. In addition to wonderfully aromatic foliage, spicebush bears gorgeous red berries in autumn that are a favorite with birds. While attracting birds is delightful in its own right, this interesting native plant also attracts a magnificent butterfly, the spicebush swallowtail, which uses spicebush as food for its larvae. After two years of disappointment, I was rewarded this spring with the appearance of three tiny swallowtail caterpillars hiding in neatly folded leaves. By clipping small notches in the foliage, the first instar larvae were able to bend the leaves over to create a tiny refuge from the prying eyes of predators. Young spicebush caterpillars are nondescript and may be mistaken for bird droppings. The tiny first instar caterpillars pass through an ugly duckling phase, the beginning of a lifetime practicing the art of deception and visual surprises. Initially the caterpillar is a glistening dark brown color with brilliant white stripes which announce to the world that it is nothing more than a bird dropping. While a dung eating fly might find this attractive, it is unlikely that any self-respecting bird would entertain a bird dropping as a meal. The small spicebush larva has one more bit of visual trickery just in case a nosy predator takes a closer look. When viewed head-on, two beady false eyespots on the thorax and two dashed white lines along the sides create the creepy visage of a viper. Since snakes are important predators of birds, this clever ruse could be just enough to frighten away a potential feathered predator. 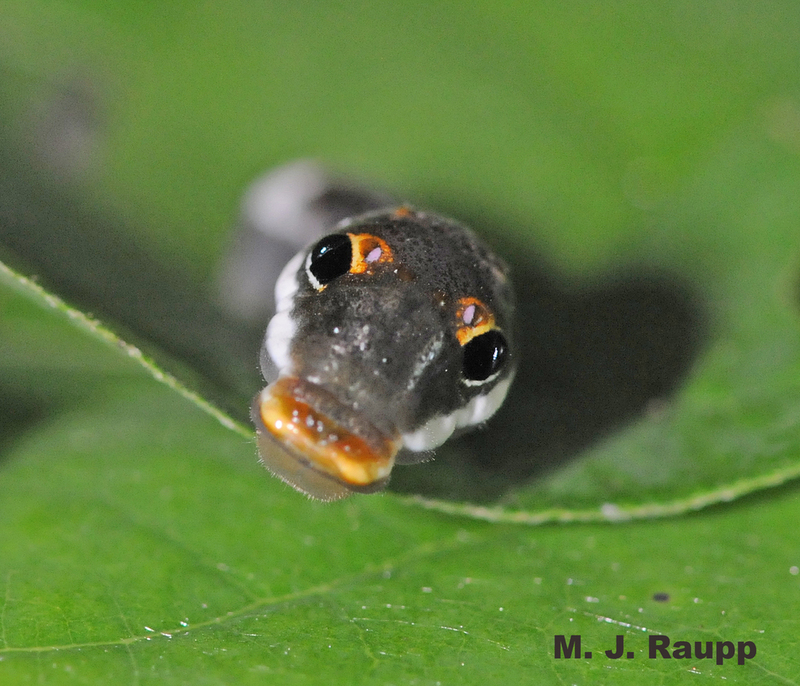 When viewed head-on, the spicebush caterpillar resembles a small serpent. As the caterpillar molts and grows, the serpent theme is repeated and enhanced with large vacuous eyespots set in a matrix of serpent green. If the art of deception fails to fool a predator, the spicebush caterpillar has one more trick up its sleeve. Just behind its head, the caterpillar houses a specialized structure called the osmeterium. Usually, this forked orange appendage is tucked beneath the skin out of sight. However, when the caterpillar is threatened, it extends the osmeterium in the direction of the attacker. This glandular organ is coated with foul smelling chemicals reminiscent of rancid butter. The disturbing visual and olfactory display might be the final deterrent to hungry predators wanting to dine on this beautiful caterpillar. 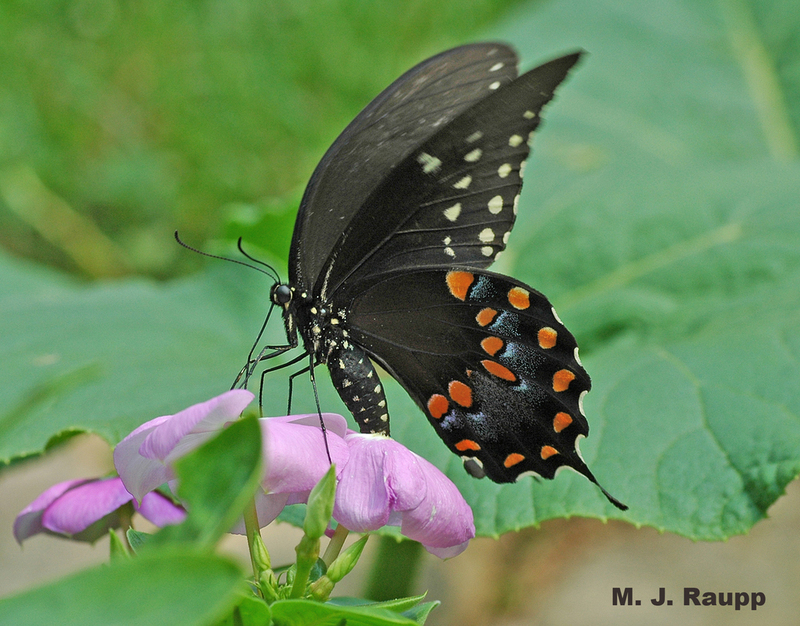 The beautiful spicebush butterfly is thought to mimic the distasteful pipevine swallowtail. Deception does not end when the spicebush caterpillar transforms to the beautiful, large adult butterfly. Dark colored wings splashed with patches and lines of orange and white are thought to mimic the coloration of the nasty tasting pipevine swallowtail, Battus philenor. A trickster as a youth and a trickster as an adult help the spicebush swallowtail to live another day. Snaking along a leaf is a fine way for a spicebush caterpillar to fool predators. Thomas Eisner’s delightful book “For Love of Insects” and David Wagner’s wonderful guide “Caterpillars of Eastern North America” were used as references for this episode.